This Mother’s Day, we’re reminding cat lovers not to forget mother cats whose kittens have flown the nest. 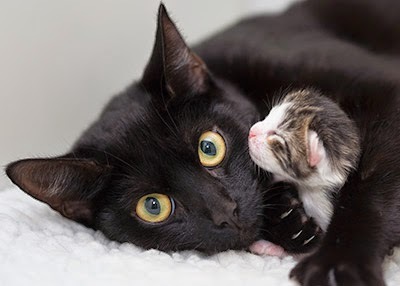 Like many of the human mothers being celebrated on 15 March, the feline mums at Cats Protection have done their fair share of child rearing! Now we want to help them to relax and enjoy the comfort of a loving home. One moggy mum in need of a home is one-year-old Zsa Zsa. 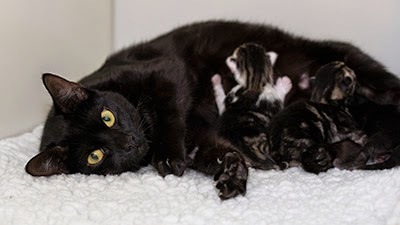 She and her kittens were taken in by Cats Protection’s Bridgend Adoption Centre in South Wales after being abandoned by their owners when they were evicted from their property. Zsa Zsa and her young kittens, Ziggy, Zara and Zina, will be available for adoption in a couple of months once the kittens have been reared. Mum Zsa Zsa will be neutered before she is homed to avoid any more unplanned litters. If you live in the South Wales area and are interested in adopting a cat please contact Cats Protection’s Bridgend Adoption Centre on 01656 724 396. To find cats in need of homes in your area please visit www.cats.org.uk and use the Find-a-cat tool.